RedNet 1 Bundle, DAW Pack from Focusrite in the Rednet series. The new RedNet Native Bundles are an almost complete solution to record in studio and home studio. They include a RedNet 1 (8 channels) or RedNet 2 (16 channels) AD/DA converters and audio interface, a Sonnet Echo Express SE I Thunderbolt chassis, the Red 2 and Red 3 plug-ins, the Dante Virtual Soundcard software for Mac and Windows (AAX compatible) and, for a limited time, a Cisco Ethernet switch (a $750 value). The DAW is not provided but you can use these bundles with the software of your choice (Cubase, Nuendo, Logic Pro, Pro Tools, etc.). The Sonnet Echo Express SE I Thunderbolt chassis allows for using the PCIe RedNet card with you Thunderbolt-equipped computers and benefit from the Dante audio network. The Ethernet switch will provide you with 5 additional ports so that you can add I/O modules if needed. 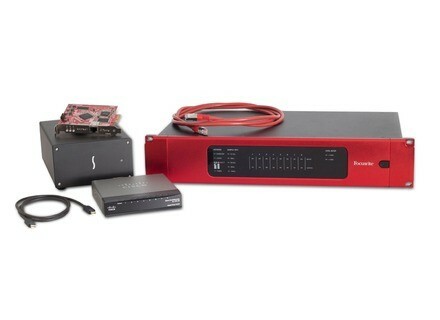 No information regarding the price of these new bundles, which details are expected soon at global.focusrite.com. Togu Audio Line unveils the TAL-Sampler Togu Audio Line introduces a new virtual synth and sample player, along with the reverb section of the instrument in a separate plug-in. 8Dio Agitato Legato Arpeggio sample library 8Dio completes its Agitato series with a string sample collection designed for very fast phrase composing.